Why not wallpaper is my question! I happen to be a huge fan. Nothing can add personality to a room quite like wallpaper. It has made a BIG comeback over the last decade. There are options out there like never before. Graphic florals, timeless geometrics, blown-up original photos, and more. Some of my go-to lines are Farrow and Ball, Graham and Brown, Thaibut, Cole and Son, Schumacher and Seabrook. I don’t believe in using it everywhere in a home. That is so 1940! Yes, I remodeled a home built in 1940 that had a different wallpaper pattern in every single room. Those old papers were a nightmare to remove. Many people still have a negative view of wallpaper for that reason alone. Thank goodness…. the new wallcoverings are much easier to remove. Some are even repositionable and peel off effortlessly. Check out a line called Tempaper that I recently discovered at the Las Vegas Market. 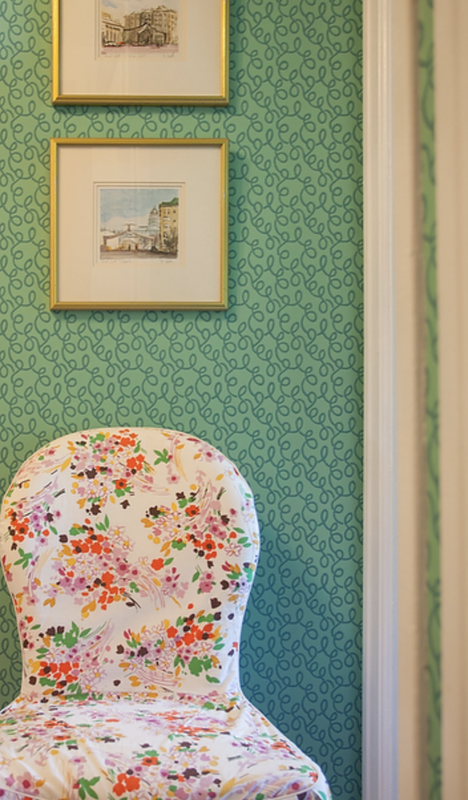 I am an advocate of wallpaper in dining rooms, entryways and powder bathrooms. Anywhere that you want to create drama and intimacy. “Go bold or go home” might be one saying that comes to mind when giving advice on committing to a pattern. And, don’t forget the fifth wall. I once chose a metallic paper for a dining room ceiling. It was truly glamorous when the chandelier cast it’s light upward. The larger the space, the more fun you can have without it seeming overwhelming. Many people feel that art “fights” with wallpaper. I don’t succumb to that notion. I may be a bit choosier about my selections, but I still hang art collections right on top of wallpaper.